Today I met my eldest daughter, Katie, (the one just finishing a degree in nursing) at Trafalgar Square after dropping off my painting at the Mall Galleries for the next round of judging for the New English Art Club Open Exhibition. We had lunch in the restaurant in the Sainsbury Wing of the National Gallery and then went down to their latest exhibition ‘Inventing Impressionism’. The exhibition is all about Paul Durand-Ruel, an art dealer who liked Impressionist paintings from the start. He bought them in large quantities – please note he didn’t sell them on 50% commission like art galleries do now – and then sold them on to wealthy Parisians. He nearly went bankrupt twice waiting for the public to take a liking to Impressionist art. 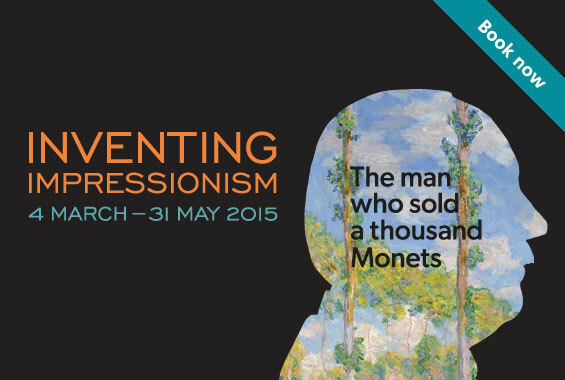 He put on solo exhibitions and large group exhibitions of Impressionist paintings and heavily promoted them. He took exhibitions to London and New York and in fact it was the American market that saved his neck. So Mr Durand-Ruel funded the difficult birth of Impressionism. We saw in the exhibition a large collection of paintings that had gone through his hands, many of which are very famous. I particularly enjoyed a series of paintings of Poplar trees by Monet done at different times of the year. But one of the things that struck me was how bad some were, how awkward and amateur the colouration. I guess they weren’t all geniuses all of the time. “So how long do you think it took to paint that one?” asked my daughter, looking at a Pissarro. “About two days,” I answered. She was shocked. “But they would say it took them a life-time of practice to be able to paint like that,” I protested. She wasn’t convinced. “That one’s bigger and has lots of detail so it could have taken a week,” I said pointing to a painting by Monet of a cliff top over a blue sea. She still wasn’t happy. But it was a very interesting exhibition and it made me think that perhaps I should be a little more patient with my art gallery owner.